Spare a thought for poor Matt Furie, a wonderful indie comics creator whose Boys' Club comics featured a lovable frog called Pepe that was adopted by the neofascist movement (the so-called "alt-right") as a symbol for racism, xenophobia, homophobia, transphobia and misogyny. Furie tried to rehabilitate his creation, which is classed by the Anti-Defamation League as a hate symbol, but did not succeed. So yesterday, in a single page comic included in the Free Comic Book Day title World's Greatest Comics, Matt Furie killed off his creation. I really feel for Furie -- it's hard to imagine a shittier fate for one's lovable creation that for it to be transformed into a symbol used by the worst people on the internet to harass and terrorize people. Furie and Fantagraphics published a Boys' Club anthology last year -- you can support him by getting a copy. Today, on Free Comic Book Day, as part of World’s Greatest Cartoonists, Furie published a one-page comic…of Pepe’s wake. 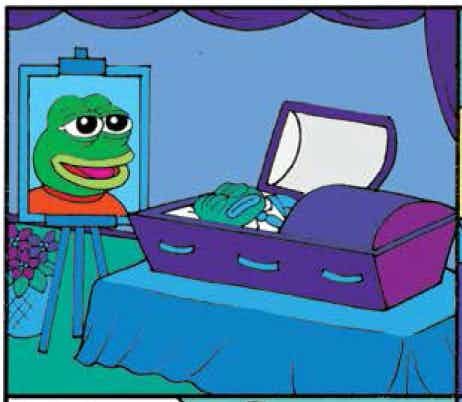 In the strip, Pepe lies in a casket while his Boys’ Club friends – Landwolf, Brett, and Andy – gather round to memorialize him. Though the tone is still marked by irreverent, slacker humor (Landwolf pours booze on Pepe’s face to toast him), it’s a clear declaration that Pepe is now dead. The alt-right has killed the joy.